Bear Bryant unautographed 1981 Athlon Sports Southeastern Football Magazine. 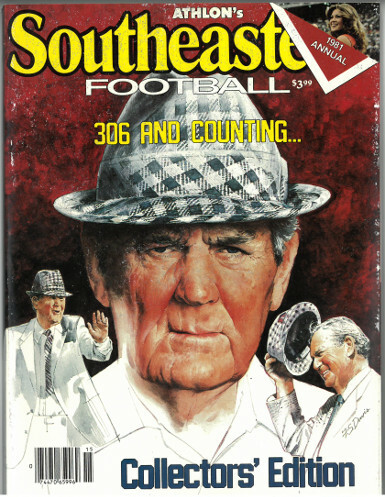 This is a rare Collector's Edition from 1981 with the great Bear Bryant on the cover with the "306 and Counting" title. Magainzes are over 30 Years old, in like new / near-mint condition. Minor wear from over 30 years in warehouse storage. Non-Circulated. As is, no returns.